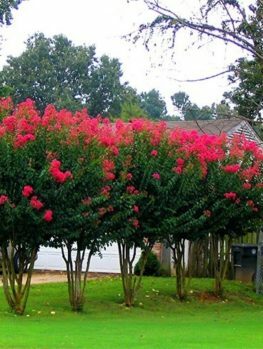 For vibrant color, nothing beats the Crape Myrtles, blooming all summer and brightening the hottest days. 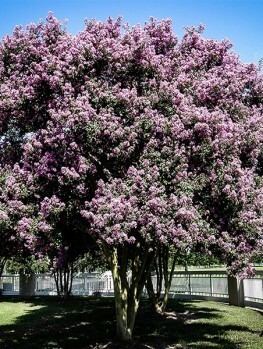 Many are shades of pink or lilac, but for the richest purple, we have the Purple Magic Crape Myrtle. This medium-sized shrub fits perfectly into smaller gardens and areas where an upright tree form is not needed. Even before flowering begins, this great shrub will brighten your garden with the red tones of its new spring growth. The leaves mature into a rich, deep green that is always glossy even at the height of summer. 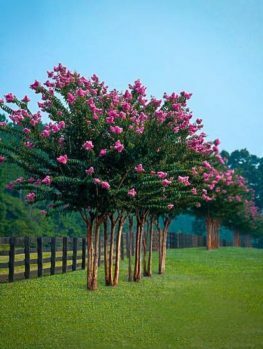 For a hot, sunny location, even in poor soil, the Purple Magic Crape Myrtle cannot be beaten. It will flower all summer and then again in the fall, after which the leaves turn orange and red before falling to reveal the mottled bark. This shrub is very drought resistant, so you can relax and enjoy its beauty without getting out the garden hose. It is also disease resistant, so always looks great even when the humid weather is at its height. Using flowering shrubs to add depth to borders or break up green spaces with a splash of color is a long-used technique that brings layered texture to our gardens and yards. 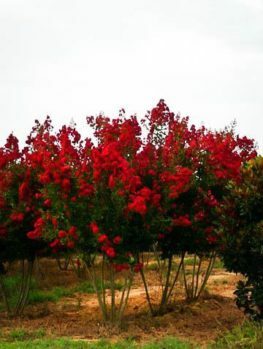 The Crape Myrtle has always been popular for this purpose thanks to the great variety of shapes and sizes, rich spectrum of colors and easy to grow nature. 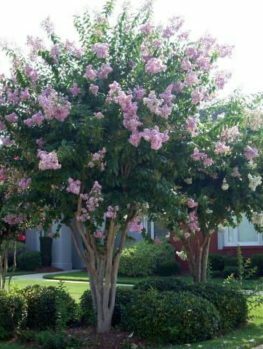 This is even more true now due to the plethora of new Crape Myrtle varieties that refine many of the characteristics gardeners treasure, allowing smaller and more compact varieties – like Purple Magic – to grace gardens where the larger examples simply would not fit. The Purple Magic Crape Myrtle is a relatively new offering from the experts at Plant Introductions Inc. and has been very well accepted in the gardening world. 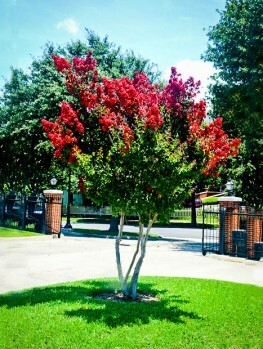 It is even hailed as the very best variety of purple Crape Myrtle in existence – quite an accolade! 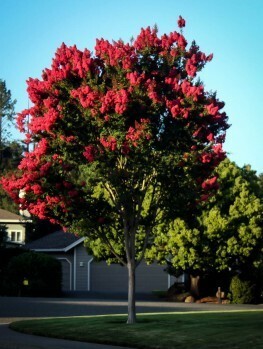 Like all Crape Myrtles, this prefers a warmer climate so it is not well suited to the much colder areas of the US. It is considered fully hardy to USDA plant hardiness zone 7 and requires a position that allows it full sun throughout the day, ideally in well drained and slightly acidic soil. If you have naturally neutral soil you can help it along by adding a little rock sulfur or peat moss when planting, and then periodically as it grows and adapts to its new environment. If you have alkaline soil but crave one of these wonderful plants then a good alternative is planting in a large pot; this way you are able to control the soil type and appreciate the splendor of the flowers. It is not advised that fertilizer be added when planting out, as this may discourage the roots from exploring out of their enriched surroundings. Good drainage is essential so soil with a high clay content should be avoided, as when wet it will allow water to sit around the roots. 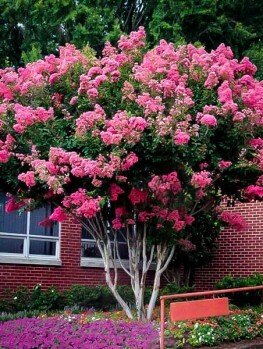 This puts your Crape Myrtle at high risk of root rot and other ailments that are easily avoided with good drainage. This said, whether planting out directly into the soil or in a pot, it is important that the first year sees a good amount of watering. Once established, however, these are very drought tolerant – although, as with many plants, some additional watering throughout the flowering period assists with a richer showing of blooms. 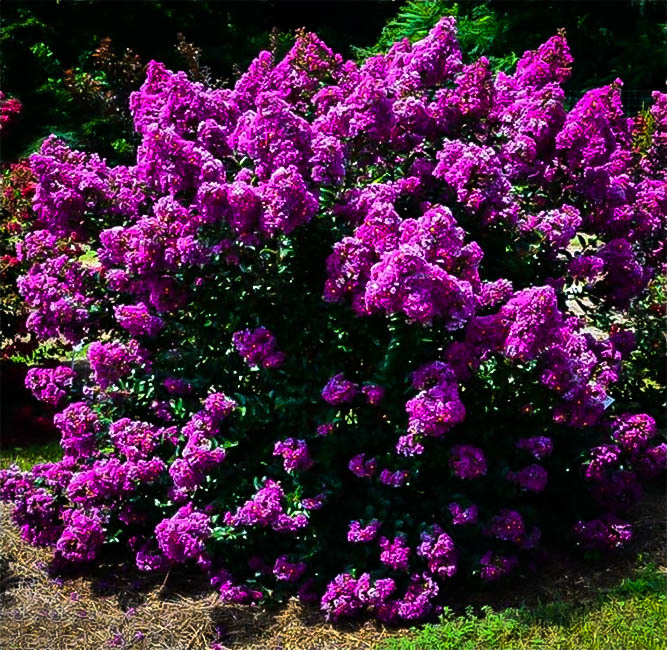 Purple Magic received its patent in 2013, so this is a very new variety indeed – and one that brings something special to the wide range of Crape Myrtles already in existence. It sits on the cusp between dwarf and intermediate (the former considered as anything reaching five feet in height and the latter those exceeding five feet) with an ultimate height of between four and six feet. New foliage appears a shade of rich red before turning a deep and glossy green, a wonderful and complimentary background to the profusion of sumptuous purple flowers with their clusters of yellow stamens at the center. 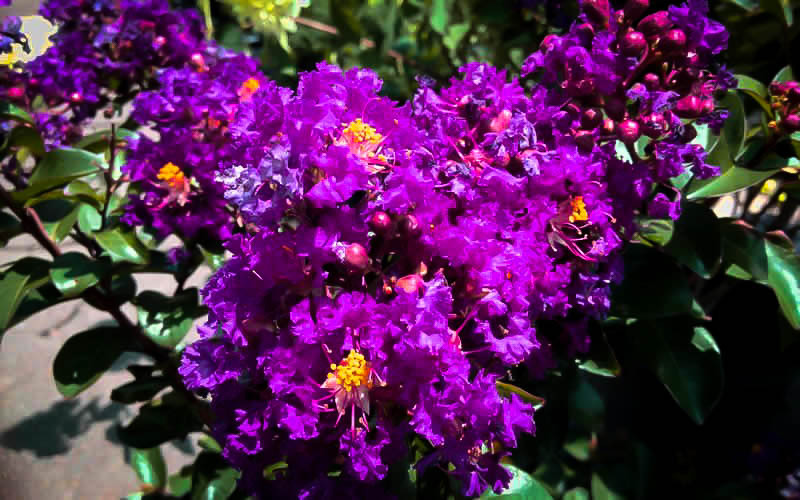 It is richness of color in these blooms that really sets Purple Magic apart from other violet colored Crape Myrtles, with the real showstopper element being the ability to re-bloom in a second burst of color around four weeks after the dead flower heads of the first round are removed. As the flowers develop and die off, the removal of these dead heads during the second bloom can prolong the flowering period; the manageable size of the plant makes this a relatively easy task, and certainly one that’s well worth doing. These are easy plants to care for and are not considered demanding, with a naturally compact growth and good resistance to disease. 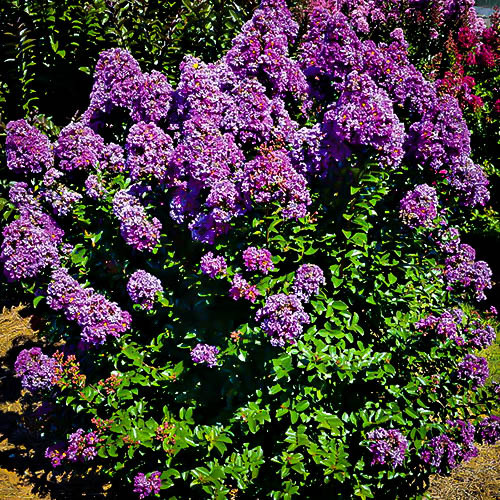 Purple Magic was developed to be low maintenance and high impact, and careful breeding has achieved a spectacular example of Crape Myrtle that will look at home in virtually any setting provided it has full sun and well drained soil. A very new addition to the family, we expect to see this appearing in gardens all over as more and more appreciators of these unique crinkly flowers realize how easy they are to grow.